An engine with a checkered past is the power of the future. In the summer of 2000, the world was about two years away from seeing the Next Big Thing in aircraft engines fly supersonically. NASA proudly declared that its Dryden Flight Research Center in California would lead the way, flight-testing on a modified F-15B research aircraft a scaled pulse detonation engine, or PDE, built by Boeing. It was an audacious notion, but the space agency was confident. The pulse detonation engine was one of its “RevCons,” NASA-speak for revolutionary concepts, and was funded as a project aimed at jump-starting the most promising high-risk, high-payoff technologies. Especially in the supersonic regime, the PDE —with thrust coming from a high-pressure shock wave rather than an ordinary flame—was a perfect bridge between conventional jet engines that start to sag past Mach 3 and scramjets/ramjets that work well at high speeds but need help to get under way. 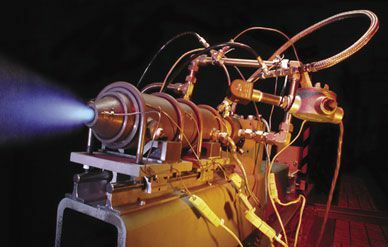 Dave Richwine, Dryden’s project manager at the time, crowed about the “exciting opportunity” to demonstrate a pulse detonation engine in actual flight, “one of the first steps in development of this engine cycle for many future supersonic” vehicles —from missiles to high-speed aircraft. Then, like so many other projects before it, this one fell out of the government’s budget ledger. No hardware flew. Papers were published, noted, and filed. Even the relatively budget-rich U.S. military wound up yanking money from its own PDE-powered high-speed missile efforts, with which the Boeing team was also connected. Now, seven years later, some of the top scientists and engineers in the field say that with the right economic incentives and a few well-placed technology leaps, they could get to a flight-ready system in five years. High jet fuel prices and the approaching limits of conventional turbo-machinery have set off another push, pitting two giants in the aircraft engine industry—General Electric and Pratt & Whitney— against each other. Thanks to generations of work and continued efforts in the early part of this century by engineering heavyweights, the pulse detonation engine, the Next Big Thing for decades now, may this time really be just a few years away. PULSE DETONATION, depending on whom you talk to, is either (A) not yet quite practical but really attractive, or (B) the super-secret propulsion behind the U.S. military’s spookiest “black” airplanes and missiles. It’s probably closer to A than to B. 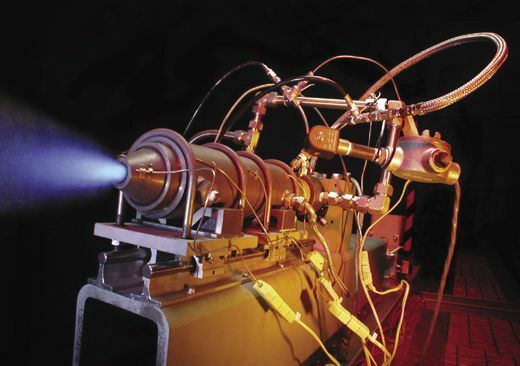 The pulse detonation engine is a refinement of an old, very simple technology: the pulse jet. Pulse jets became notorious as the power behind Germany’s World War II-era V-1 buzz bombs. The rockets were simple, cheap, gas-guzzling, and extremely noisy. The buzz bomb went by several names. English speakers called it the Doodlebug, but Nazi propaganda chief Josef Goebbels gave it the name that seemed to stick, the Vergeltungswaffe 1, or Vengeance Weapon 1. You can see one of these sheet-metal-and-plywood V-1s at the National Air and Space Museum in Washington, D.C.
During the war, the Germans lobbed thousands of these crude cruise missiles toward Britain and Belgium, using steam-powered catapults on ski ramps on the French and Dutch coasts. Powered by an Argus As014 pulse jet, the V-1 needed to reach a relatively high speed before its engine could operate. Not much more than a long tube, the engine had a simple flap at one end, like a doggie door but designed to open only one way. The flap served as an intake valve for air forced in by the missile’s forward speed. A simple system injected fuel into the tube. Once air and fuel were mixed into a combustible combination, the mixture was ignited, causing an explosion. The expanding pressure wave forced the doggie door shut and the gases exited at the rear of the tube. The series of controlled explosions gave the bomb its characteristic “buzzing” sound. The PDE takes this idea one step further. The slow, gentle flicker of candles at dinner and the explosions inside the pulse jet share one characteristic: They burn subsonically, in a process scientists call deflagration. The process happens faster in an explosion than it does atop the candle, but nonetheless the chemistry takes place at speeds of, at most, tens of feet per second. By contrast, detonation—the “D” in PDE—happens supersonically, with combustion occurring all at once. Detonation of a fuel-air mixture produces a high-pressure shock wave that speeds down the length of the tube at faster than five times the speed of sound. The shock wave itself creates a compression that instantly ignites fuel and air in the rest of the tube. As the exhaust gases exit from the tube, the pressure at the forward end drops. That pressure drop sets the stage for the cycle to repeat, dozens of times per second. The process is called pressure-rise combustion, and it’s a drastically different, higher-energy affair than simply burning a fuel-air mixture with a flame.